A lonely farmer comes up to shake our hands and say "have a good holiday" near the Healy Pass. 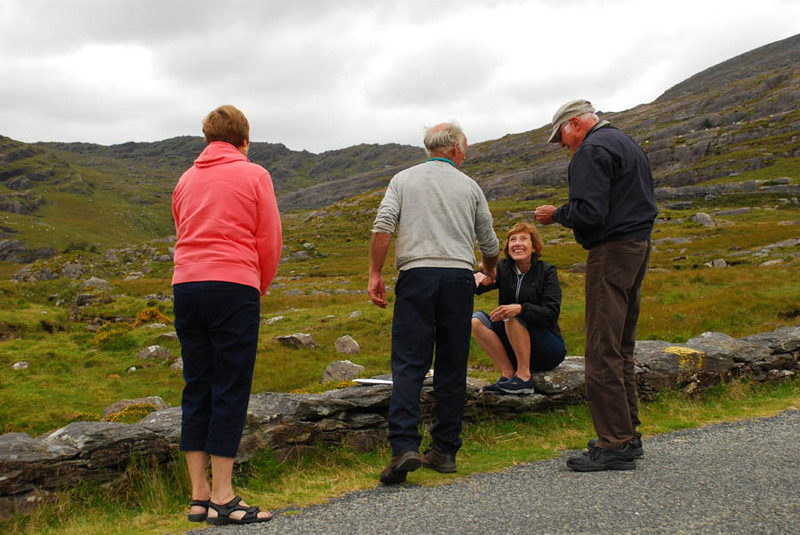 We had an interesting experience the other day while having a picnic near Healy Pass, County Cork. We were sitting on a low stone bridge spanning a babbling brook, complete with nearby waterfall. It was a perfect setting out in the wild country leading up to the stunning Healy Pass. While we were enjoying our tuna salad sandwiches, a farmer on an old tractor came clattering up the long road from the valley below. He got out and came over and shook each of our hands, wishing us a “good holiday” and asking if we were having fun. I thought perhaps he was going to ask for a Euro each as a land trespass fee, or perhaps he had seen our car parked on this road from below, checked us out through binoculars and then thought he had better come and check to be sure we hadn’t run over one of his sheep. In reality, as we found out later from our hostess back in Kenmare, he was most likely just painfully lonely. Bachelor farmers get the short end of the stick when they are stuck on the farm taking care of their parents until they pass on. Before they know it, they’re in their 50s and the train of marriage has left the station. What follows is a life of boredom and intense loneliness. We thought of this as we drove on through the countryside, admiring the neat little isolated farms in the distance, but wondering what kind of life some of the owners had. Posted in Ireland Tours and tagged farmer, healy pass, picnic.